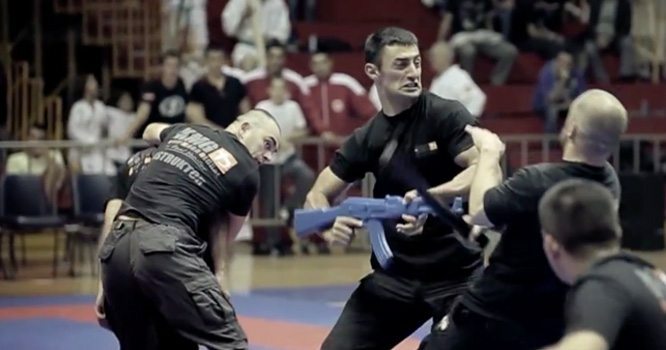 Third Party Protection or VIP Protection is one of the pillars of Krav Maga training. In its civilian self-defense curriculum, KMG includes basic protection of a third party (a family member, child, friend, etc. ), where principles and techniques for self-defense are applied to the protection of others. For professionals, KMG VIP Protection Training provides a comprehensive program developed over decades of work in the field. Our Experts have trained close protection officers (CPOs) and security teams for various government sectors as well as private clients. We prepare CPOs with the tactical, technical, physical, and mental skills designed for the protection of a VIP in armed and unarmed combat situations. We also provide training for a unit or organization’s in-house instructors on how to teach and train CPOs and their supporting teams. 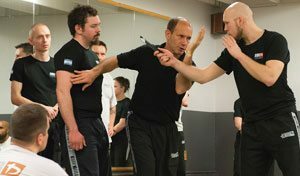 Why Do CPOs Need Krav Maga? In many countries, CPOs rely on the use of firearms to carry out their duties in a conflict situation or an attack on principal (AOP). However, as many CPO professionals know, there are numerous situations where firearms cannot be deployed in protection of a VIP. Some examples include: a) illegality of firearms carriage in certain countries or states; b) when the level of conflict does not legally allow the use of a firearm; c) when it is too dangerous to use a firearm; or d) when deployment of firearm would be too slow or too late. In these cases, CPOs need to possess unarmed combat and defensive tactics and skills in order to effectively do their job. KMG Krav Maga VIP Protection Program focuses on training CPOs and security professionals to deploy appropriate solutions against all kinds of attacks and threats, from non-violent, non-lethal circumstances to violent and life-threatening situations. Furthermore, KMG training covers mental conditioning for performance and correct decision-making under mental duress (i.e. minimal light, surprise situations, injury, etc.). Have the techniques been tested and proven under real life conditions? 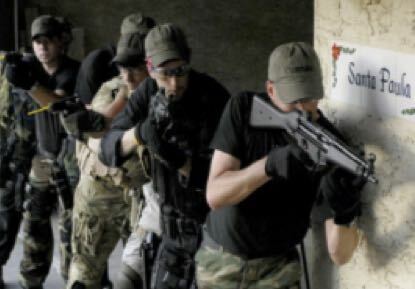 Would the techniques be able to address all different possible potential attack scenarios, simulations, weapon threats (sharp, blunt, long, short, guns, grenades) environments (dark, confined spaces), disadvantages (on the ground, outnumbered, surprise), situations (stressful, high risk, extreme violence, crowded, distractions, urban, CQB), different kinds of attackers (extremely strong, large or violent), multiple opponents, etc. Are the techniques easily to learn? Can trainees attain a high level of proficiency within a relatively short period of time? Are the techniques easy to retain and remember? Can one maintain and retain what has been learned for a long period of time? Is your system well integrated? Incorporating technical, physical, tactical and mental preparation? Can be seen as a real system with connections and integration between its parts and sections, or is it a just a collection of different techniques from different styles? KMG Krav Maga fits the description of all of the above: It is has been tested and proven in real-life conditions, it address all potential attack and threat situations, it is relatively quick to learn in a short amount of time, it is easy to retain, and it is well integrated as a real, effective, and coherent system. What is covered in the KMG VIP Protection Training Program? Prevention, de-escalation and avoidance of violent physical conflicts and interactions. Use of tools, baton, flashlight, pepper-spray, TASER and other non-lethal weapons; use of handcuffs and other means of control and apprehension. KMG also works with professional clients to design courses and workshops that complement existing standard operating procedures (SOPs). Our training is for dealing with events leading up to, during, and after an attack on principal (AOP). Any VIP or 3rd party protection drills and formations the course will cover are merely provided on the most basic level so as not to interfere with existing SOPs of professional units.